In 2014 ‘Lonely Planet’ magazine put Sikkim at the pinnacle of its yearly global ‘top 10 regions to travel’ list & ever since North Sikkim got so popular. Leaving ‘Kimberley, Australia’ and ‘Yorkshire, England’ gasping at the second and third spot, Sikkim carved out a niche for itself in the perspective of the entire travel community. How did it manage to do that? Well, ‘the answer my friend is blowing in the wind’ somewhere on the icy peaks or the high passes or the green rocky slopes of the cleanest state (Officially in 2012) of our country. ‘Sustainable community-based tourism’, an environment of safety in which tourists could feel secure, and lastly an eco-friendly inclination of its tourism policymakers, made this happen. The least populous yet geographically the largest province of Sikkim has drawn tourists from all corners increasingly over the last decade. An area as geo-politically sensitive as it is being on the frontiers of a not-so-friendly neighbor, North Sikkim as has been presumably for thousands of years, predating all the man-made geo-politics of restrictive lines drawn on maps, is inconsequentially but a remarkable reminder of how ‘The Creator’ wanted it all to be, limitlessly resplendent. The region of North Sikkim is quite vast. Moreover, it is extremely difficult for the average traveler to get access to some of the extreme fringes, either due to a dearth of connectivity or restrictions for being a strategic militarized area. To sum it up apparently, there are two facets of the North Sikkim anecdote. One which is fairly common in regards to the tourism, while the other is still somewhat shrouded in oblivion for most, attempted by a few very adventurous kinds. The former commonly comprises of Lachen, Gurudongmar Lake, Lachung, Yumthang Valley and Zero Point, generally done by tourists of all genres from Gangtok on fixed all-inclusive packages. The packages vary in duration from 1night, 2days to 3nights, 4days. They vary on other parameters as well like, the kind of vehicle provided, exclusive or shared, quality of accommodation etc., consequently varying in per person cost. From as low as Rs 3000 per person for a 1 nights, 2 days Gangtok-Lachung-Yumthang Valley-Gangtok trip including transfers in a shared Sumo/Bolero and all meals, to 30000 per person for Gangtok-Lachen-Gurudongmar Lake-Lachung-Yumthang Valley-Zero Point-Gangtok over 3N4D in an exclusive vehicle like Innova/Scorpio and accommodation in the best properties in the region, there is something for everybody and every budget. The latter comprises of places less traveled, generally involving treks and camping. Some of which are Green Lake, Muguthang, Lhonak Valley, Chopta Valley, Katao Valley, Dambung, Lhasar Valley, Phuni Valley etc. Most of these places have no connectivity by road and are completely uninhabited but needless to say are thus, preserved in their rawest serenity. 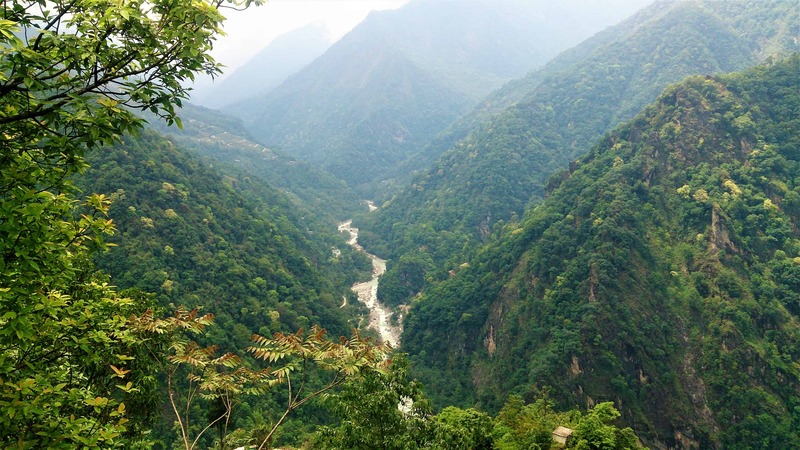 The ‘North Sikkim Highway’ is effectively the only road that connects Gangtok to the region, passing by for most of its length, the mesmerizing river Teesta and small towns, waterfalls, hydel projects and scenic mountain vistas. The landslide prone road is maintained by BRO with great priority as it serves as an essential supply line for the heavily militarized border with China. 17 KMs on the highway from Gangtok is a site of huge historic importance for the Sikkimese. This is where the ‘Treaty of Blood Brotherhood’ was signed and adopted in the early 14th century between the Lepchas and Bhutias to ensure a peaceful co-existence in the region for the time to come. Statues of the men who made this happen remain in a small garden on a hill, with prayer flags tied to the trees all around. The entrance is from just beside the road following which some 30 steps up, a cemented porch with sitting benches appear. The place is silent with a whiff of the history of these mountain people in its air. Colorful silk scarfs can be bought and tied to the trees. The locals believe it can fulfill wishes. a small town about 32 KMs from Gangtok, would have been inconsequential otherwise if not for two things. The first being the picturesque confluence of the Dikchu and Teesta rivers. The second being, the 100 MW hydel power plant which is named after the place itself. There is a bridge while exiting the town from which the confluence looks remarkable with a quaint little two-story cottage right at the fork of the confluence. Unfortunately, this is not a hotel or homestay but an NHPC watchtower to monitor the water level. A good place to get off from the car and stretch the legs for some time. It is the first important town en route, 38 KMs from Gangtok. The Phodong Monastery, built somewhere around 1720 is one of the most important monasteries of Sikkim belonging to the Kargyupa school of Tibetan Buddhism. Not far from which is the forgotten Tumlong, which was for some part in history, the capital of the ‘Kingdom of Sikkim’. However only ruins remain today. Rabdantse, which is in West Sikkim was the first capital of the kingdom, after which it was shifted to Tumlong for 90 years. What remains of the erstwhile palace, the grand Chortens, capped by invading thick green bushes, wear an eerie appearance, as if metaphorically insisting that glory is only but temporary. The administrative headquarters and the biggest town of the North Sikkim district is a busy little beautiful hamlet 53 KMs from the state capital. It is where the wilderness meets civilization for the residents of this region. With private schools and hospitals, restaurants, shops and few good hotels, the town can be a brief stopover. Mangan marks the beginning of the Tibetan Plateau north henceforth. This is the last place where things are sold on MRP, so if you have something to buy at the last minute, medicines, liquor or cigarettes, snacks or other eatables, Mangan is the place. just about 4 KMs ahead of Mangan is slowly gaining popularity for its strikingly astounding views of the Kanchenjunga and Siniolchu peaks. The Singhik Viewpoint is just beside the road where people can stop over for a peek, but generally, the view of Kanchenjunga is clearer in the early mornings and tends to get hazed out as the day progresses, unless if you are extremely lucky. However even the general view amiss the peaks is quite spectacular with the meandering Teesta deep down with the surrounding valleys diving into it. There is a beautiful heritage tourist bungalow in Singhik, where tourists can stay for a night. Tung comes next at 72 KMs from Gangtok, is the first checkpoint where permits for everyone traveling further up north are checked. It is a common stoppage, generally to click a few pictures for tourists visiting the region. 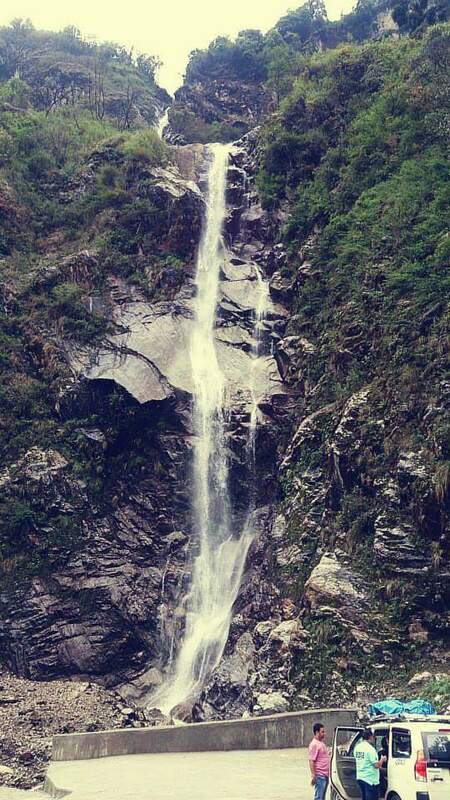 Situated between Toong and Chungthang, the Naga waterfall gets its name for its appearance like a serpentine snake, winding its way down. In late summer, when the volume of water is more, the waterfall looks quite appealing. At around 100 KMs from Gangtok, the only sub-division of the North Sikkim district, under which all the areas north of here fall. Chungthang is probably the second most important town of North Sikkim after Mangan. 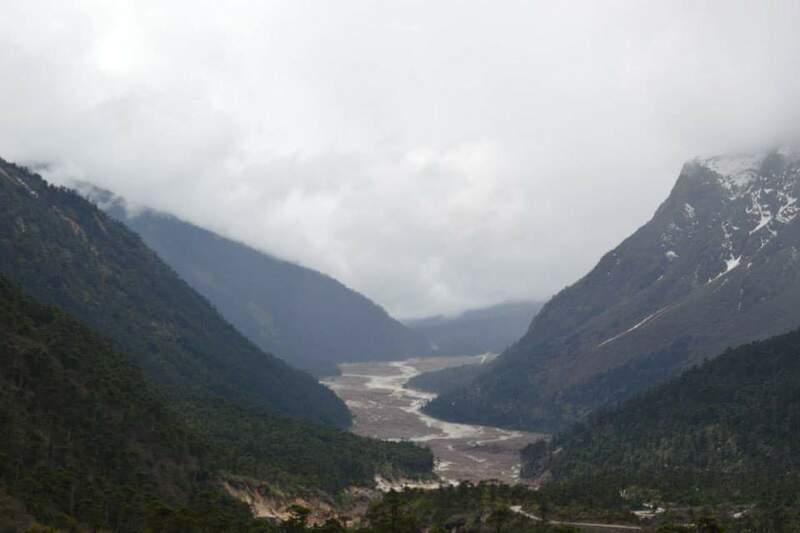 Chungthang is where the mighty Teesta takes form geographically, at the confluence of the Lachen Chu and Lachung Chu rivers. A massive 1200 MW Hydel power plant is being built here, for which the entire southern tip of the town is being reoriented. A huge dam is being built and an intermontane tunnel is being dug up supposedly to change the course of the river. Opposing sentiments exist about the project and its impact. The North Sikkim Highway bifurcates from Chungthang. The right goes towards Lachung and subsequently to Yumthang Valley culminating at Zero Point. The left goes towards Lachen, leading further on till Gurudongmar lake. Chungthang also contains the biggest forward military base in North Sikkim. There are a cafeteria and a health center bang at the bifurcation run by the army. The cafeteria is quite good with restrooms and a parking lot overlooking the dam being constructed, which makes many to stop here for a cup of tea or the very tasty plate of fried Wai Wai. Someone visiting both Lachen and Lachung has to cross this place thrice. Once while going towards Lachen, again when moving to Lachung from Lachen and finally when exiting Lachung on the return. It is said that Guru Padmasambhaba during his journey towards Tibet stopped here briefly sometime in the 7th century. His footmarks are said to be contained in a stone somewhere in Chungthang, surrounded by paddy rice plants, which cannot grow in these conditions normally. Inhabited historically by the ‘Lachenpas’, an alpine town at 9k feet, situated on a small flat meadow beside a deep gorge at the depth of which river Lachen Chu flows rapturously, surrounded by pine conifers and towering snowclad mountains all around, Lachen has emerged lately as an important destination for tourists, travelers and trekkers from around the globe. Numerous hotels have hence sprung up giving the hamlet more concrete than it deserved. The climate is cold, especially at nights throughout the year. The winters are harsh and bring plenty of snowfall with it in the months of January-February. Lachen is 28 KMs from Chungthang, 125 KMs which is around 6-7 hours drive away from Gangtok. The Lachenpas, a sturdy and introvert race who have survived these conditions for centuries, were primarily Yak herders. The Yak is of supreme importance for these people and their sustenance in these parts. As almost no crops or vegetables are cultivatable in these geo-climatic circumstances, Yak and at times sheep, are used for all purposes to sustain life. Yak skin is used as protection against cold, tents made of it were used in the early times. In addition to its milk, meat and as a mode of transporting people and luggage, even yak-dung is used, as fire-fuel to cook and stay warm in its dried form, while also as an excellent insulating layer, plastered on stone walls to keep off the cold gush. Sheep are used for their milk, meat, and wool. Lachen’s shot to fame in the last decade can largely be attributed to its proximity to the famous Gurudongmar Lake. It serves as a stopover for the night after arriving from Gangtok or any place south, before leaving early morning to witness the second highest lake of India at 17100 ft. Lachen’s altitude aptly acts as an acclimatizer for the tourists. Lachen is also the base from where the popular trek for ‘Green Lake’ begin. Thangu is at an elevation of 14k ft is halfway between Lachen and Gurudongmar Lake. After an early morning start from Lachen, people stop here for a quick breakfast of Maggi and Eggs, also to get the hang of the grueling altitude rise. 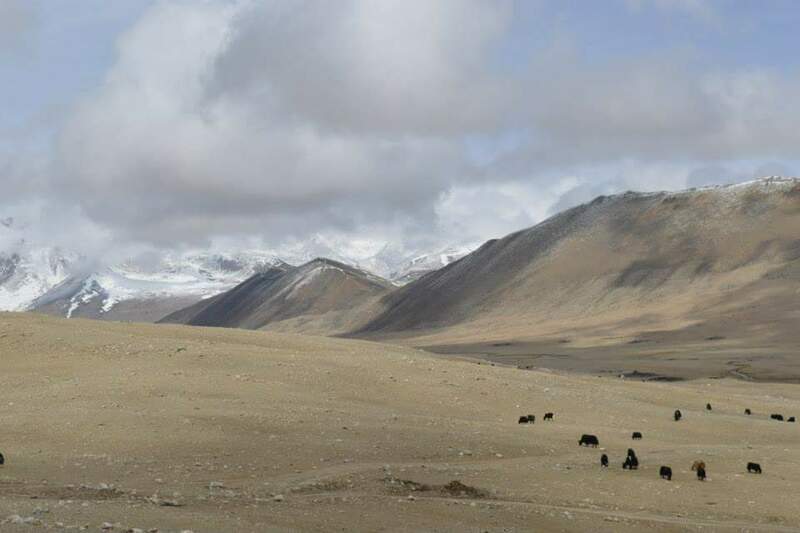 The journey from Lachen to Thangu is scintillatingly beautiful. Tracing up the Lachen Chu with nothing apart from alpine wilderness all around, some stone-fenced grazing grounds for Yaks with one or two surreal log cabins or a distant waterfall on an unimaginable slope, suddenly somewhere one rises above the tree line and all signs of life disappear. Thangu has a large army base with around 10 shops selling popcorns (believed to help cope with the altitude), chocolates and liquor, apart from the quintessential Maggi and Omelets. It can get very cold and windy at Thangu. Thangu is actually a valley in itself. Generally submerged under snow from October to March, the valley wakes up to flamboyant colors of Rhododendrons and grassy meadows in the months of spring. Lachen getting congested has resulted in some accommodation come up in Thangu Valley, which apart from being pristine and untouched, is also a gateway to some of the rarely visited yet perhaps the most inexplicably alluring places of the region. 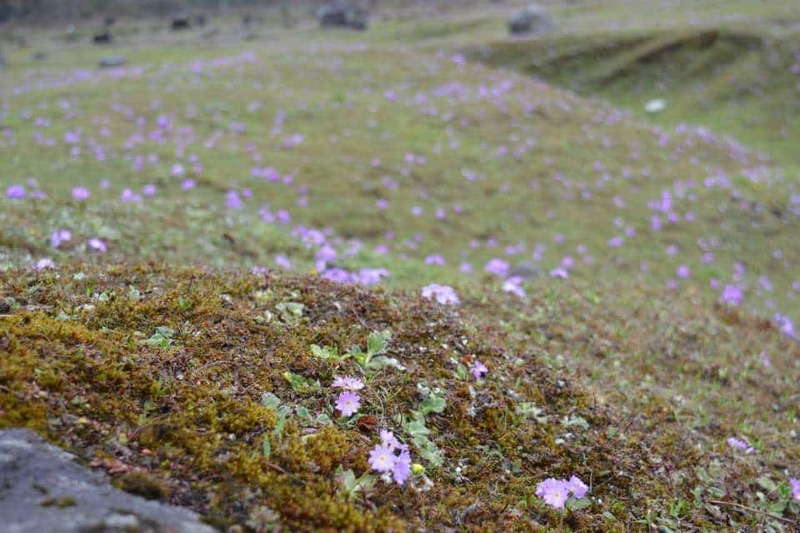 It connects with the verdant and wide Lhasar Valley to its south, the Chopta valley and the Lhonak Valley in the north-northwest. A drivable road exists between Thangu and ‘Kalapatthar’, which marks the beginning of the Chopta Valley. 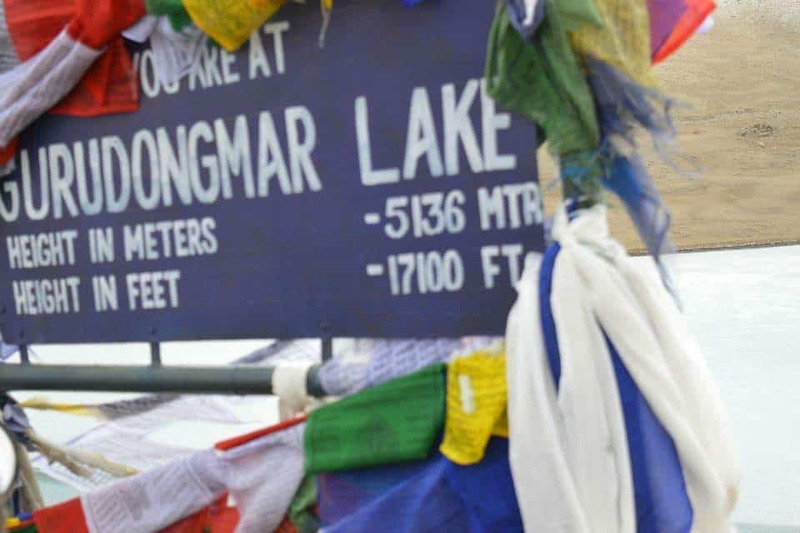 Foreigners are only allowed uptil here while Indians generally do not go that way as they continue for the more exciting Gurudongmar Lake. 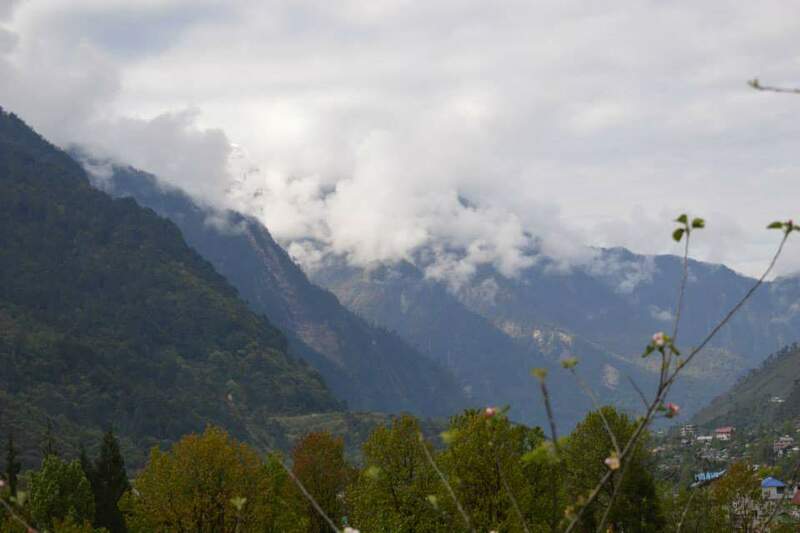 Some tourists have recently started to skip staying in Lachen and come to Thangu directly for the nightover, however sleeping at 14k feet can be hazardous if the body is not properly acclimatized. Thangu is 35 KMs and a 2 hour drive out of Lachen. 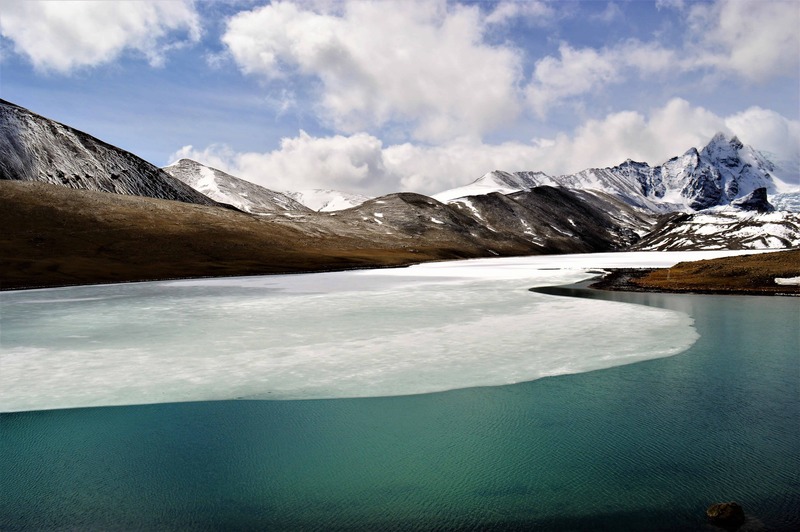 Gurudongmar Lake is further 40 KMs and another couple of hours from here. The change in altitude is 8k ft over just around 70 KMs. The road till Gurudongmar from Thangu is sure to be open only between the months of April to October. The terrain is mostly a cold desert, arid, starkly grey. The roads are non-existent at places. The safest option is to keep following the telephone wires which are for the military bases. There is a final military checkpost about 10 KMs short of the lake where an army jawan would literally come and take a peep inside the cars to see if everyone is okay. There is an operative health center along with a cafeteria run by the jawans. A doctor is available all the time who readily helps if someone is unwell either in the way up or down. It is baffling and at the same time humbling to see the sacrifices of these men in green camouflage jackets, ever so unwavering, relentless in the call of duty for our motherland. Another 15 minutes of bumpy ride and it appears. 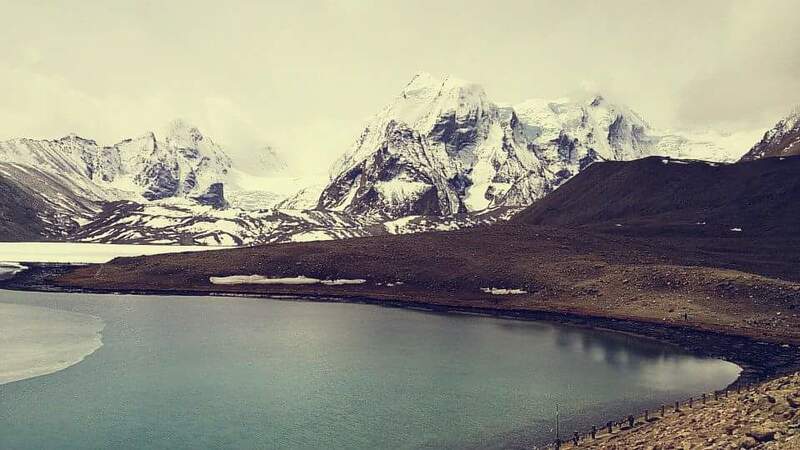 Gurudongmar Lake. Amidst the brown-yellow-grey desert-like aridity till the eyes can see, like an oasis, a mirage in its truest illustration. Except its really there. 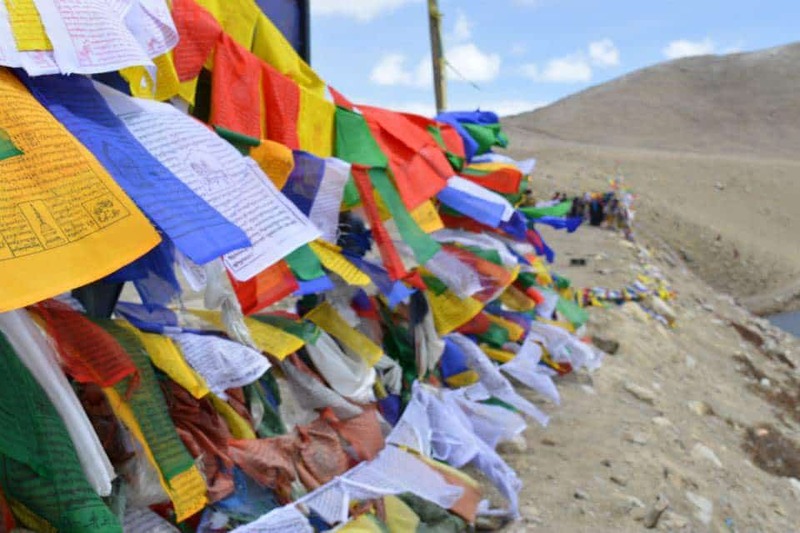 A bluish-green lake, semi-frozen, emanating as a moraine from the snout of a glacier, laden around for most of its circumference with colorful Buddhist prayer flags, revered alike by Hindus and Buddhists, that is Gurudongmar. Some part of the lake remains frozen throughout the year due to its altitude. A flight of stairs goes down to the lake’s waters from till where the vehicles go. The altitude is written on the nameplate, 17100 Feet. Prolonged stay or physical exertion is not advised. Even going down and up the stairs can leave you gasping for breath. A couple of army jawans who are stationed there primarily to help out the tourists, try their best to make them leave after 10 minutes or so, but you just won’t want to leave, such as the exceptional spectacle of the place. Incidentally, the highest lake of India, Cholamu Lake or Tso Lhamu at an elevation of 18k feet is not far from Gurudongmar. A 10 KM dirt road can land you there in about half of an hour but there is a catch. Being acutely close to the Sino-Indian border, the permits are off limits generally for civilians. However, some have managed to make it till there either by obtaining the special permits from Gangtok through some army contacts or by some arrangements on the spot, if you know how the rules can be bent a little in India. Together the Cholamu and Gurudronmar Lakes give origination to the Teesta. 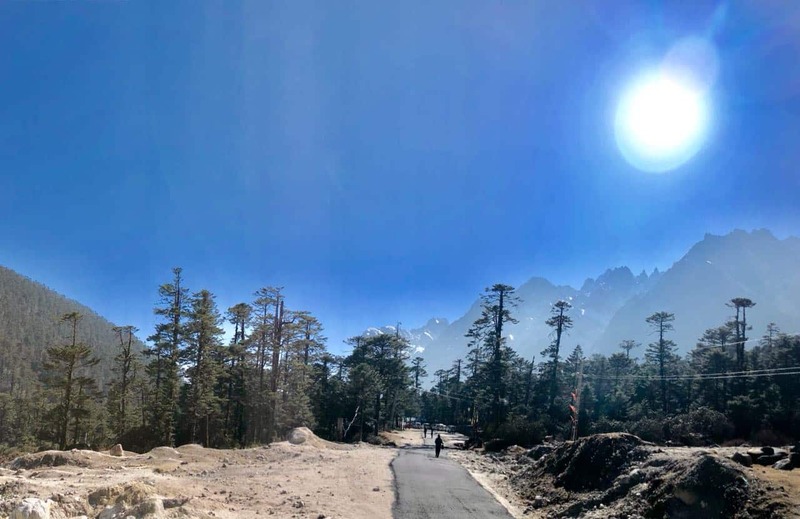 There exists a dirt road which connects this region of Gurudongmar-Tso Lhamu to Zero Point, which people visit from Lachung. Geographically the two regions are not that far apart, rather just separated by the DonkiaLa pass. This route is used just by the army trucks if there is any obstruction on the Lachen-Gurudongmar route. I have heard people say that the BRO is planning to build a proper road in future, which if true and sees the light of reality someday, could make possible a round trip of Chungthang-Lachung-Yumthang Valley-Yameysamdrong-Zero Point-Tso Lhamu-Gurudongmar Lake-Thangu-Lachen-Chungthang. Won’t that be amazing? Lachen also has a small monastery which can be visited along with a handicraft arcade in the main market where shawls, blankets, carpets and bags etc., handcrafted by the local Lachenpas from yak and sheep wool can be brought. Another gorgeous hill town, which has gained prominence in the recent history as a coveted destination for mountain lovers. Lachung these days, draws one of the highest tourist footfalls in the state. 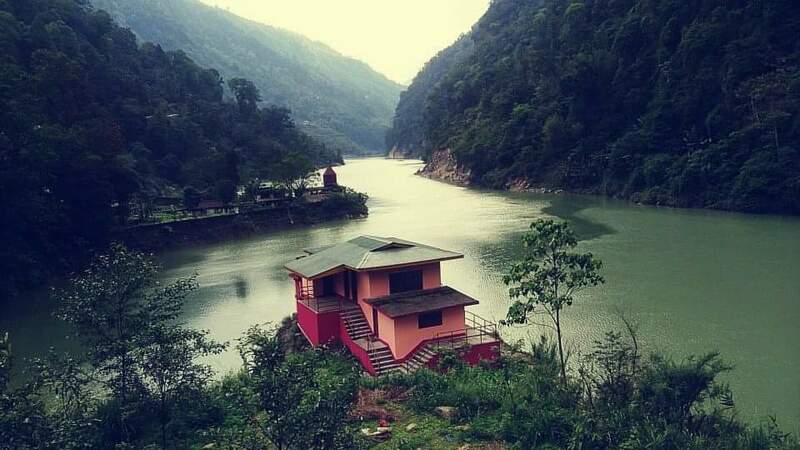 Some posh hotels have come up for which reason in this town perched on both sides of the river Lachung Chu connected by a small cantilever bridge. 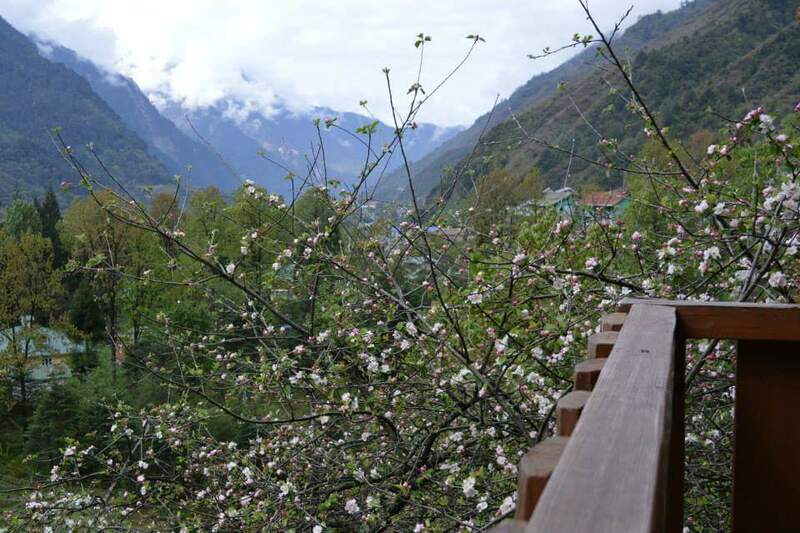 Surrounded by barren towering mountains, at an elevation of 8600 feet, with orchards of apple and apricot, Lachung abounds with tourists almost around the year. In the summers its mostly overbooked, while in winters too, people come in plenty to witness snowfall. The locals call themselves ‘Lachungpas’. Lachung is located at about 120 KMs from Gangtok and takes about 6 hours to reach. 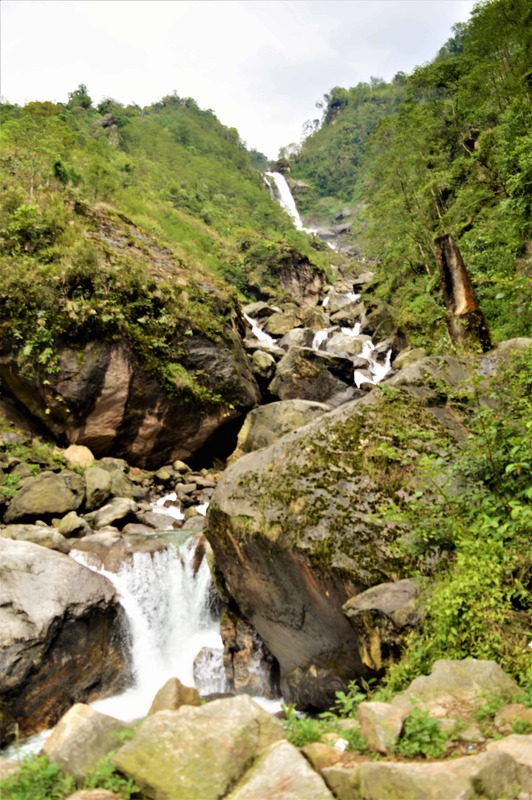 From the fork in Chungthang, it is a 22 KMs journey on the road that goes right, just about at midway of which, Bhim Nala waterfall, strikes the eye being just beside the road. A scene in the film Aakhen starring Amitabh Bacchhan was shot here which has added to its fame. While the waterfall is beautiful, it has been encroached upon by tea sellers and to get close to the waters over a wooden man-made bridge, you will have to shell out 10 bucks for no clear reason. 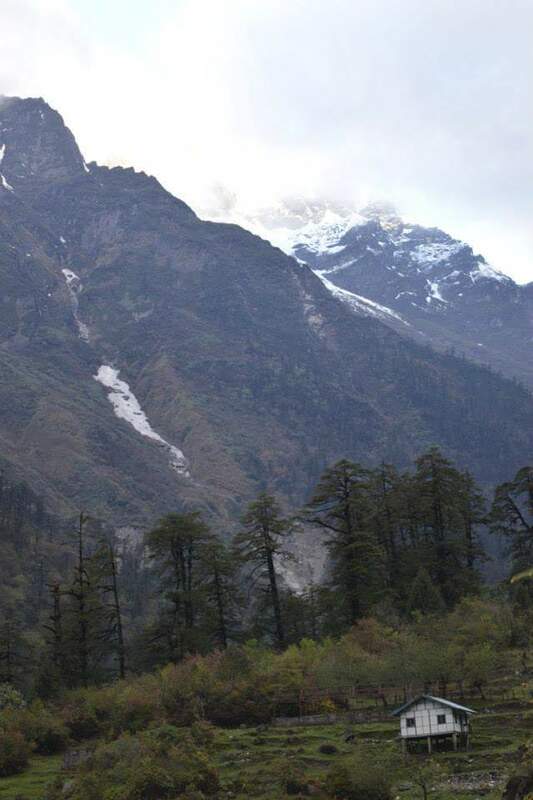 Almost everyone visiting Lachung does so to witness the majestic Yumthang Valley. Located at 25 KMs from lachung, Yumthang takes around 1.5 hours to reach. Often compared to Switzerland for its similar picturesque landscapes, Yumthang Valley is an enchanting place to be, at any season. Particularly so during the blooming season of Rhododendrons during the months of March to May. This part of the valley, spanning across 35 square KMs, abounds with every imaginable color during this period. 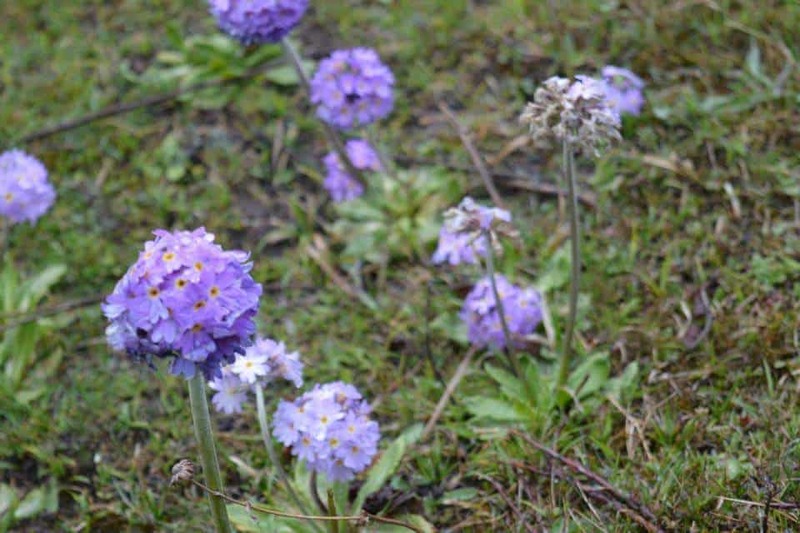 At an elevation of about 12k feet which is above conventional greenery, the valley slopes are entirely veiled with more than 30 species of Rhododendrons beside Poppies, Iris and Primulas. 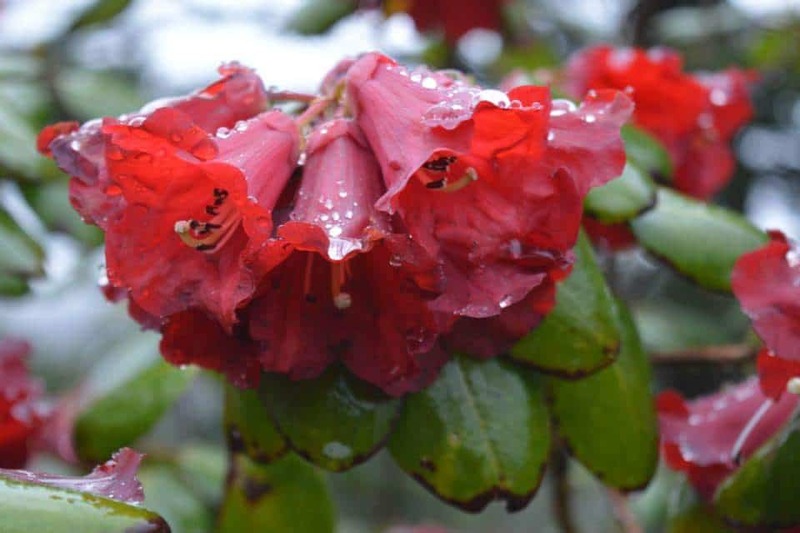 The state forest department organizes an annual International Rhododendron Festival in the month of April at Yumthang. The Lachung Chu meanders through the fairly flat valley, with rugged ice-capped peaks encircling the horizon. In winters the valley recedes underneath a thick blanket of snow which is no less alluring. 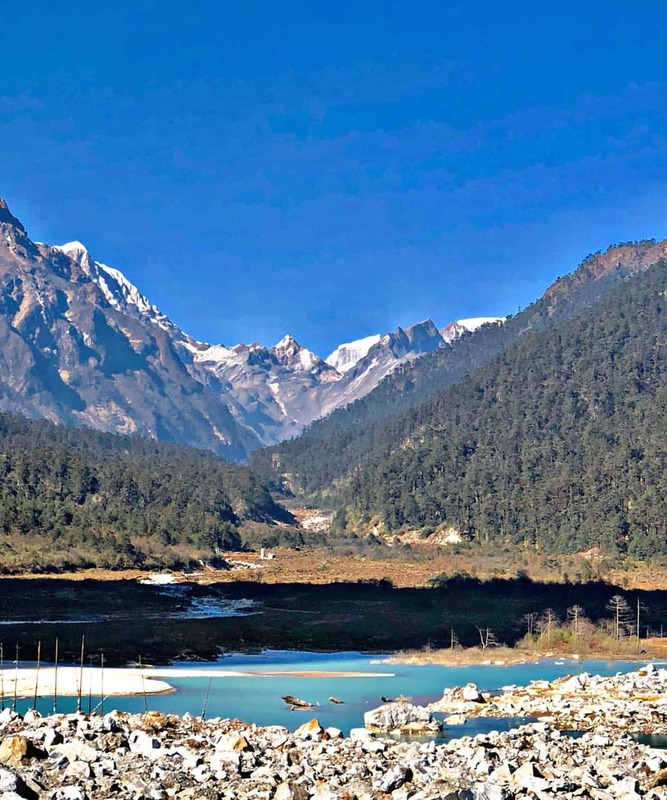 Which is why, Phuni Valley, about 10 KMs from Yumthang is slowly evolving as a skiing destination, thanks to conscious efforts and intentions of the Sikkim Mountaineering Association (SMA). Its lovely slopes with proper snow being at 11.5k feet is apt for the sport during the months of December to February. Just prior to reaching Yumthang, a wooden elevated pathway goes across the river stream from the main road. A 200 meter walk over which takes you to Yumthang Hot Springs. It is surreal that a hot sulfur spring is situated at this altitude and climate. There are separate log cabins for men and women, with small pools to take a dip in the waters believed to have medicinal properties. 25 KMs further uphill, at 14.5k feet lies Zero Point. It is where the black top road ends, hence the name. The place, very close to the Sino-Indian border, is perennially covered under snow due to its elevation and other geographic factors. It gets very windy and it is bitterly cold. In the months of April-May one can see the snow melt infront of their eyes and create a stream. Locals sell tea/coffee, Maggi and even alcohol for the excited tourists during the peak seasons. Snow boots are getable on rent and can be handy if you wish to walk the slopes with knee-deep snow. Euphoric tourists going berserk on perhaps their first sight of snow is a commonplace scene around here. A restricted dirt road used only by military trucks continue on after the black top civilian road ends, which goes by the banks of Tso Lhamu before reaching Gurudongmar. It would be delightful if this road is opened up for tourists in the near future. 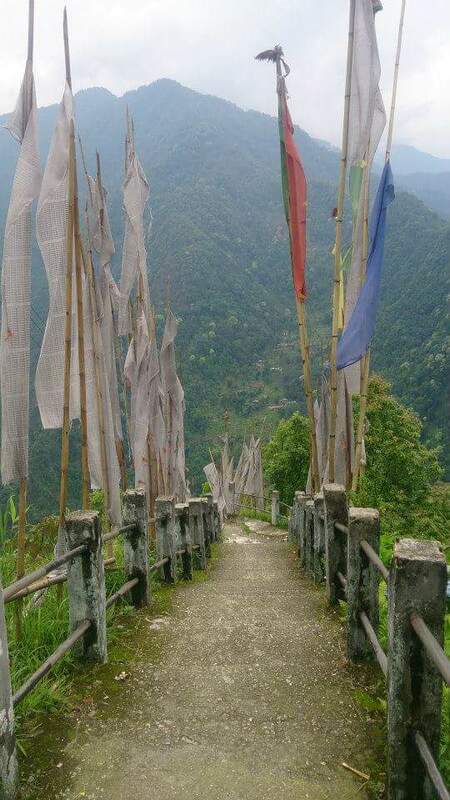 A little about 5 KMs short of Zero Point from Yumthang, a cantilever bridge laden with prayer flags, marks the confluence of Lachung Chu and Sebu Chu. This is Yameysamdrong. This place used to be called Zero Point earlier. 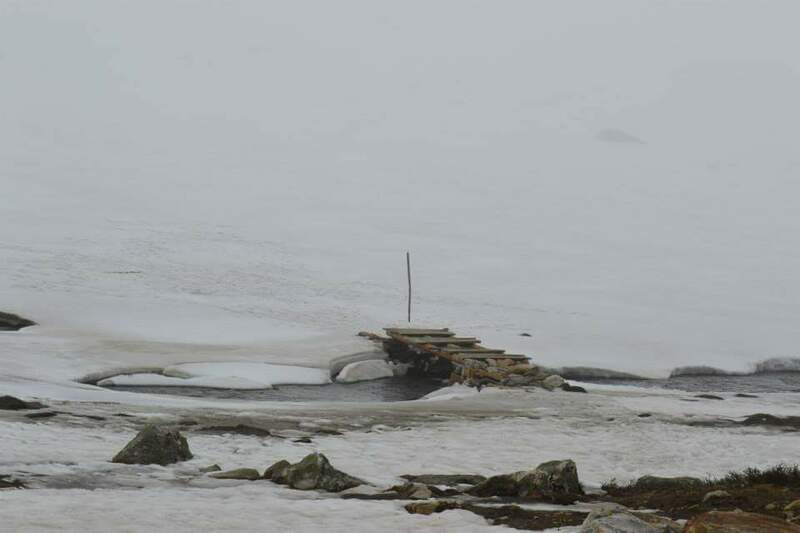 There is supposedly a hot spring here as well besides being either the starting or ending point of a three-day trek that connects the Yumthang Valley with Thangu Valley, going across the Donkia La (18400 feet) and the virgin Lhasar Valley. Yumthang Valley has been pictured in many movie scenes shot here. There is a chic forest bungalow just around the parking area where tourists stop to take a stroll till the river stream while grossly overusing their camera clicks, perhaps justifiably so. This properly was leased to a Gangtok based hotel chain but unfortunately, they have stopped taking bookings citing the remoteness of the area, absence of any other settlement or facilities nearby and the fact that it gets unbearably cold and windy after daylight gives in. A string of small shops has also been set up, where the locals sell handicrafts, snacks & tea etc. A little before the eye-catching arched gate of Singba Rhododendron Sanctuary, a road cuts right. This leads to a tiny little village within the Yumthang Valley National Reserve. At 14 KMs from Lachung, Dambung or Domang Valley is being promoted as one more sightseeing point out of Lachung. The route is extremely scenic, through winding roads, icy streams and waterfalls, silver fir and rhododendron foliage. On another direction than Yumthang, across and beyond the bridge over Lachung Chu, 25 KMs away lies the prettiest secret of Lachung. Katao or as also referred to as Mt. Katao at an elevation of about 13k feet could have been as distinguished or perhaps even more so than Yumthang, but sadly its extreme immediacy to the border with China, has restricted that from happening. No permits are issued for this place formally hence it is never a part of any standard North Sikkim package. 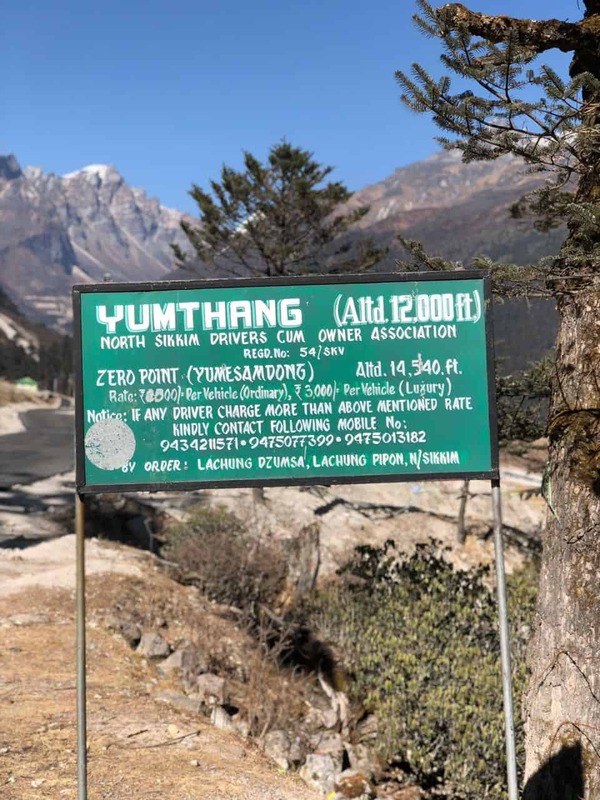 However, with a bit of fortune and some extra cash, the driver of the vehicle can manage to take you there after some back-channel negotiations while in Lachung. A splendidly magnificent waterfall, which would be partly frozen in spring or early summer, exists around midway, probably the best in the region. Poppies, primulas and Rhododendrons crowd the slopes in purple-red-blue-white shades, while at the higher reaches fresh powdery snow abound for most of the year, besides a bewitching panorama of snowcapped mountains. There is an army forward camp at the end of the road but no one is allowed past a checkpost before it. A pleasant walk across the cantilever over Lachung Chu, treading further on the Katao road, or alternatively through a slightly longer route through alleys passing by apple, peach or apricot gardens, would land you at a relatively small yet aesthetically appealing two-storey ‘gompa’, staged amidst a calm and placid surrounding, with a backdrop of a slope, beautifully shelved. This is Lachung Monastery. 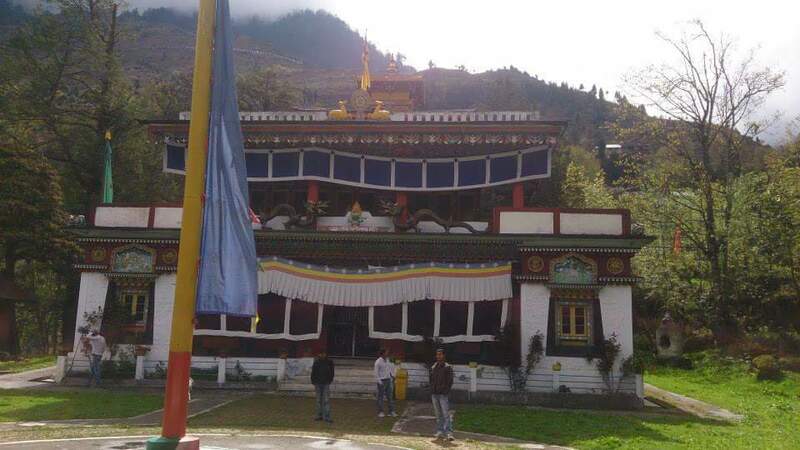 Built in around 1850, this Nyingma Buddhist monastery is not to be missed while in Lachung. Siliguri with the nearest railhead at New Jalpaiguri (NJP), which is connected on the railway map from almost all major cities of the country, and Bagdogra (IXB), with daily flights from Kolkata and Delhi is the nearest airport. Gangtok is 130 KMs and a 4-5 hour drive from SIliguri. Helicopter service is also available between Bagdogra and Gangtok and takes 30 minutes to reach. Lachen is 125 KMs from Gangtok, while Lachung is 120 KMs. Both take around 6-8 hours to reach. Vehicles generally come included in the package that one has to take from Gangtok with necessary permits. If someone is wishing to drive or ride by himself, separate permits for the vehicles need to be obtained either from Gangtok or from Mangan. The PAP (Protected Area Permit) are issued from the DC offices. Individual permits can be obtained easily and generally taken care of by the travel agents all by themselves on being provided with copies of passport sized photographs and any identification proof. There is an alternative way to do a North Sikkim trip without having to go to Gangtok. If you reach Siliguri by 9 or 10 AM, and have an exclusive vehicle, you can directly go up to Mangan or Singhik the same day itself. Mangan is 140 KMs and would take around 7 hours to reach taking the Singtham-Dikchu route, hence bypassing Gangtok altogether. Next day after getting the permits from Mangan, trail on to Lachen or even further up to Thangu. Alternatively, if you can get the permits done in advance by sending in your documents before your arrival to your driver or agent, you can go all the way up to Lachung on the first day itself. However, it would be a hectic journey of over 8 -9 hours. The ideal time would be the months of Spring and Summer, and then the fall and early winters. From late-March to mid-June. Again, from October to early-December. It actually depends on personal preference. If witnessing a snowfall is what you are looking for with clear views, and can bear the sub-zero nights, go there in late January-early February, however, you may not be able to reach up to Gurudongmar at that time. The months of April to June are generally quite crowded. Avoid the monsoon months as landslides and flash floods are quite commonplace in the region. Day 1: Start early from Gangtok. Depending on preference, stop at the places enroute discussed earlier. Arrive at Lachen before sundown. Rest and acclimatize. A short walk to the Gompa can help you with the latter. Day 2: Start very early around 4 AM. Stop at Thangu briefly for breakfast. Visit Chopta Valley if interested (can be visited while returning as well). 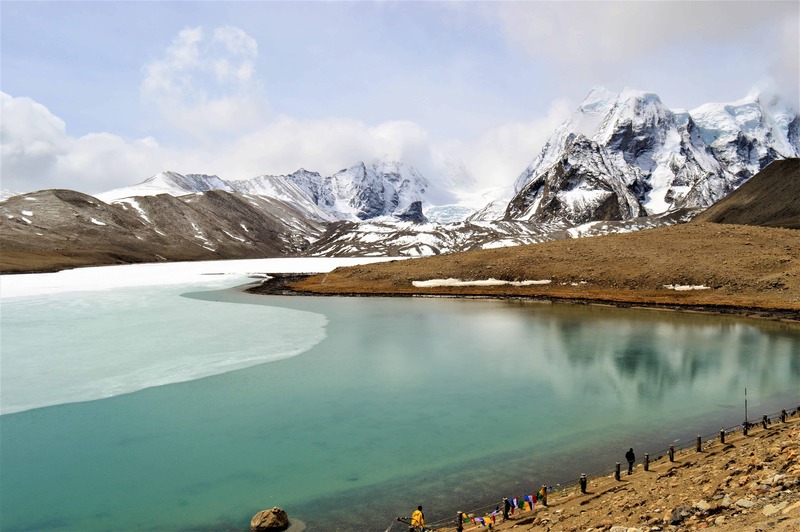 Visit Gurudongmar Lake and return to Lachen by noon. Post Lunch move to Lachung and reach by sundown. Day 3: Start early again, go straight to Zero Point. Stop at Yumthang Valley on return. Return to Lachung by noon. Post Lunch, start the return journey towards Gangtok. Day 1&2: Same as above. Day 4: Arrange with your driver for Katao. Visit Katao after an early Breakfast. Come back to Lachung and start the return journey towards Gangtok. The roads of North Sikkim are extremely landslide prone and are hence not always in the best of shape, in spite of the relentless efforts by the BRO. While finalizing a trip from Gangtok, do so in the presence of the driver who would drive you and clarify all the points of visit with the agent and driver agreeing with them. 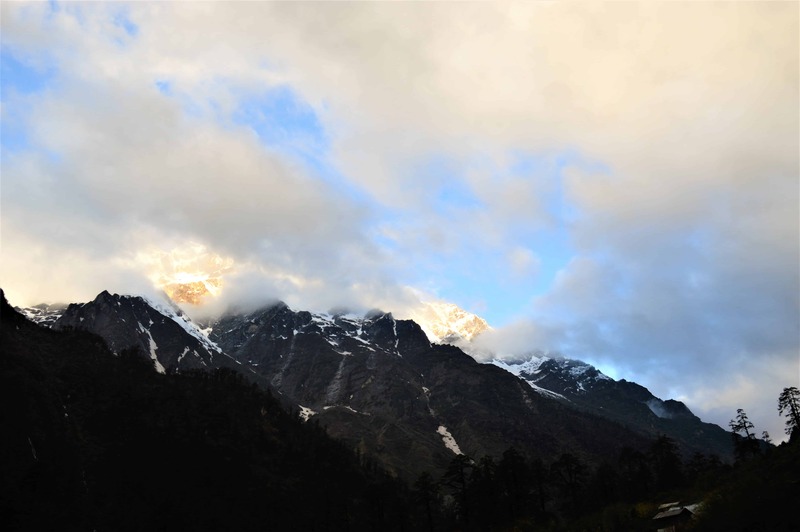 It is not advisable to venture out alone unless an emergency in the villages of North Sikkim after 7 PM in the evening. The locals are harmless but given the climatic conditions, binge drinking post-sundown is quite common. Though an all-inclusive trip is how it is generally done, one can easily arrange all the facets separately by themselves with a little research. For example, nowadays some hotels in Lachen and many in Lachung are on various online booking portals. One can book them on the dates they wish to visit. Then you can contact a travel agent in Gangtok or a driver directly to settle the transportation and permit part. The people of North Sikkim are a little different from even the rest of Sikkim itself. Their language and customs differ. They are not as sociable as people elsewhere in the state. Be respectful to their customs and culture and polite. Never take pictures of the army camps or bases. Carry medicines like Diamox and Decdac for the altitude. Smoking in public places is banned and commonly taken seriously by the people. 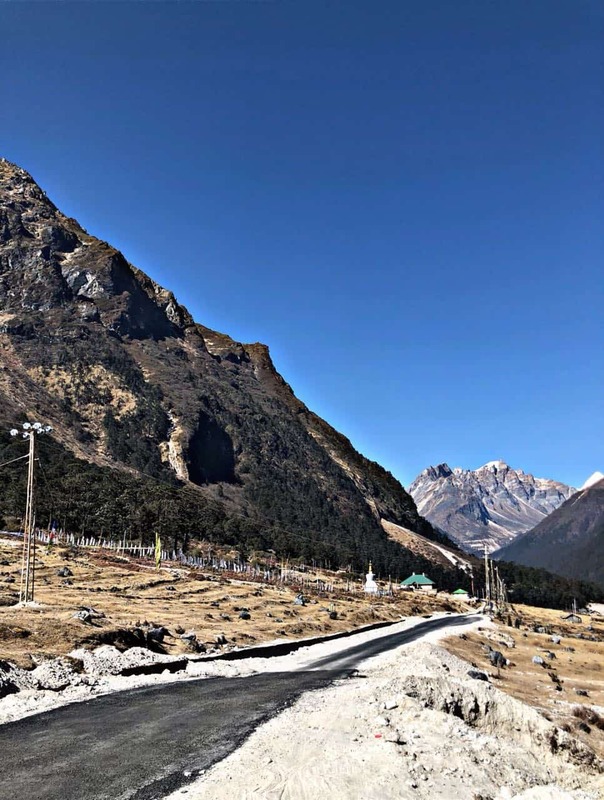 North Sikkim – Where to Stay and Eat? Generally, the stay and all meals during the entire duration of the trips, also the ones had enroute are covered in the standard packages. Both vegetarian and non-vegetarian options are available. There are various categories of hotels, budget, standard, luxury, and premium, and are priced likewise by the travel agents. Enlisted below are some well-known travel agents for the region, apart from which if you land up at M.G.Marg, Gangtok, scores of them are to be found. Yak ‘n’ Yeti Travels and Expeditions, Gangtok. Mr. Bablu Rain, drives his own Xylo, I did my trip with him. A very charming man from Gangtok. He can arrange everything from hotels to permits. A 4-star property probably the sole one in Lachen. Amenities: Room Heaters, TV, Wooden Floors, Wifi. View Rooms. Lachen and Lachung being prominent tourist destinations these days have facilities like Internet, Police Station and basic healthcare. However, there are yet no ATMs. Vodafone and BSNL work fairly well. There are provision shops which sell almost everything from Liquor to chips and chocolates. No networks work in the beyond Yumthang and Thangu. It is advisable to get your required cash withdrawn and essentials bought from Gangtok itself or at Mangan. Plastic water bottles are completely banned in North Sikkim but the hotels sell them to their guests. The nearest petrol pump is in Mangan. Often overlooked in comparison to the north-western Himalayan provinces, Sikkim is no less in promise and grandeur. This tiny hill state has a flavour like no other. With a solid tourism infrastructure in place and blessed immensely by Mother Nature, it holds tremendous potential for nature lovers, mountain connoisseurs and adventure seekers. Apart from that, Sikkim is a gastronomical treasure island. The cuisine is a pleasant fusion of Tibetan, Nepali and East Indian palates. The cleanliness of the place can put a lot of others to shame. Be here once and in all possibility you will come back again. Get permission own vehicle. North sikkim….. i love deive………..